Leading corporate furniture solutions manufacturer Eximious Furniture designs and produces handmade corporate furniture from their factory in Leicestershire, UK, delivering high-end projects throughout Europe. Although the firm has been in the industry for a long time, it’s still leading the way with its use of many different materials and custom finishing. Their attention to detail on each piece of furniture led them to work with Heritage Upholstery in order to meet their clients’ specific finishing requests. As part of a much larger order of furniture for a customer in Berlin, Germany, Heritage designed and manufactured brass slipper cups, finished to an aged brass finish. 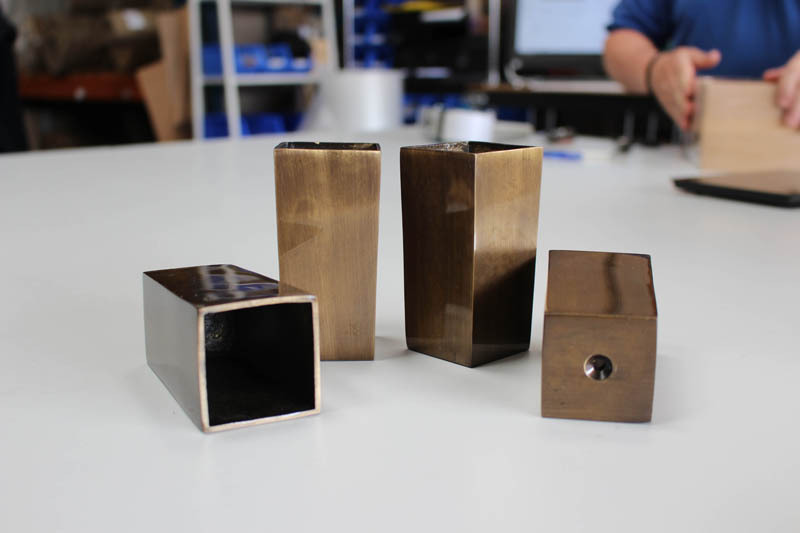 Terry Batchelor, project manager at Eximious explained: "It was difficult to find a manufacturer for just 4 pieces of Antique Brass slipper cups (leg caps) for a bespoke furniture job for a European client. Heritage Upholstery designed these for us; 3D printed a prototype cup so we could make the furniture, and then delivered quality brass cups in approx. 1 month from enquiry to delivery. We met our tight timescale, and hope to work with Heritage again soon." For more information email info@heritageupholsterysupplies.co.uk or call and speak to a member of the team on 01522 685974.